The Italians are incredibly passionate about wood-fired pizza and the Pizza Napoletana tradition. So much so that the Italian Ministry of Agriculture and a number of trade organizations have decided to protect the Pizza Napoletana name, the brand and the product by granting it the DOC (Denominazione d’Origine Controllata) status. Much like Chianti, Prosecco, Parmesan, Mozzarella and certain types of olive oil, the Italian government is committed to protecting its country’s culinary heritage. Do you want to make Pizza Napoletana at home using a Pizza Stone? Check out the free Forno Bravo Pizza Stone Pizza eBook. We can show you how to make authentic Italian pizza in your conventional oven. 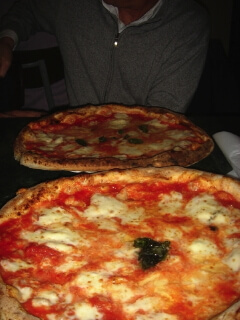 Today, there are various Pizza Napoletana associations in Italy. The Verace Pizza Napoletana Association represents the interests of the pizzeria community, and is responsible for protecting the Vera Pizza Napoletana brand, and has an extension in the U.S. that offers certification, while the Pizzaioli Napoletani Association looks after the interests of the pizzaiolo community. There are a number of U.S. restaurants that are certified and display the VPN logo, including Niebaum-Coppola in San Francisco and Palo Alto, California. The VPN specification was originally created at a meeting of Naples’ most venerate Pizzaioli, who came together to define the perfect pizza — they even signed a public declaration supporting the specification. That must have been one heck of a meeting. Click on the Basic VPN Guidelines to see what this is all about, and to work out your own strategy for what it means to your restaurant, pizzeria, or home baking. What we think is most interesting about the story is that these efforts clearly outline what Italy, and more importantly the Neapolitans, think a real pizza should look and taste like. For example, the specification clearly states that a pizza must have a 0.1″ thick base, (a little more than a credit card), must use fresh mozzarella, must be thrown by hand, must use Extra Virgin Olive Oil, and must be cooked in an 800ºF (or higher) wood-fired oven for no more than 90 seconds. In an attempt to end the age-old “thin crust or thick crust” debate, we have translated the EU document and posted it for you to enjoy. Click on our Vera Pizza Napoletana Specification to read the text. You can buy the ingredients defined in the Pizza Napoletana specification from the Forno Bravo Store. Vera Pizza Napoletana from Naples.